Quite recently, a very wonderful gift for my children arrived at our doorstep which will help in their physical, mental and even psychological well-being. Curious what it is? It's not food, not books, and not even toys. It's a RINGO Chair - a chair that is growing with the children. 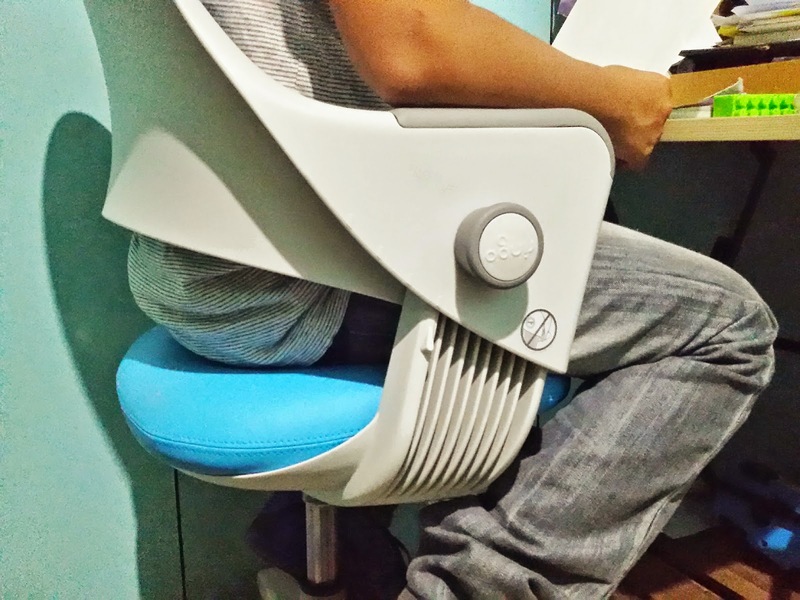 I was really curious when I saw this ergonomically and intelligently-designed chair. Why? 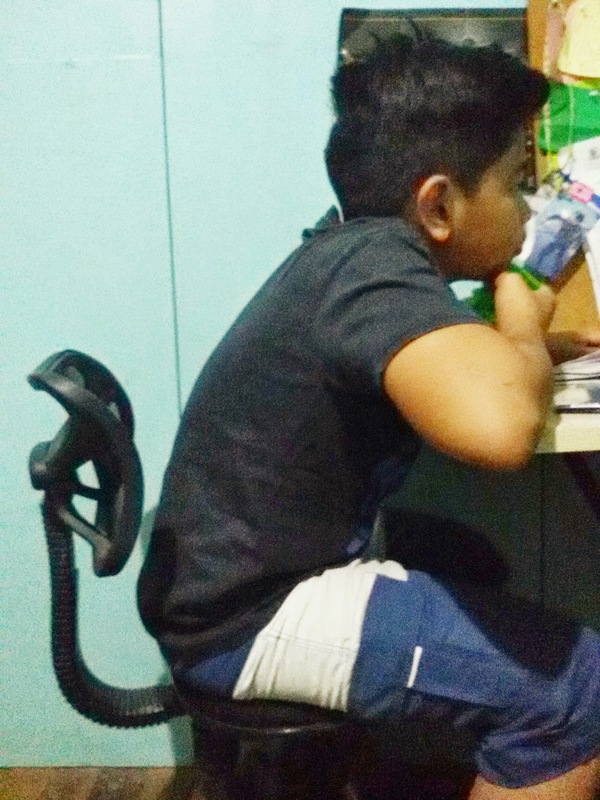 For all the studying years of my elder son, we've put up with the challenging, uncomfortable and problematic chairs which weren't helpful with my son's posture, which I found out is one of the reasons why children find it hard to concentrate on their studies. Did you know that bad posture is detrimental to anyone's health? Not only it's physically unattractive, it could pose serious problems to our neck and lower back by experiencing strain, could cause carpal tunnel syndrome, and abnormal bone growth for our children which may be hard to correct over time. 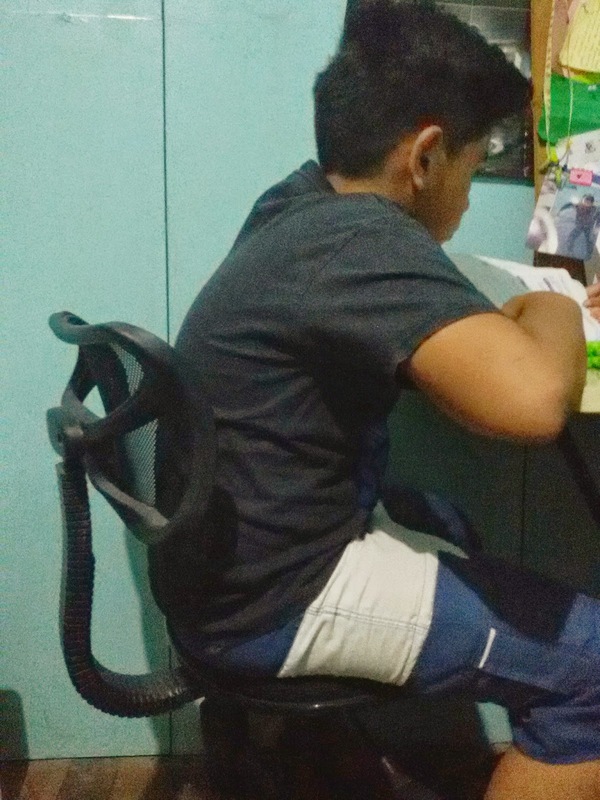 Here were some bad study chairs my son used in his study area: First a Computer Chair. Notice how his back tends to arch towards his study table just so he could see what he was writing or reading? Very bad I know. Notice too that his upper and lower back do not even touch the back rest? 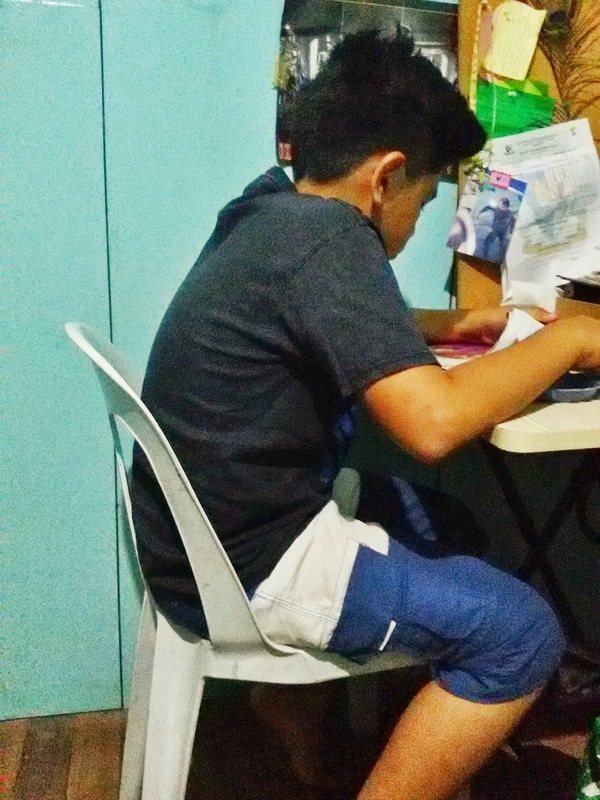 Oh no, poor sitting or studying posture for my son. No wonder he didn't find his nice study corner a favorite spot. 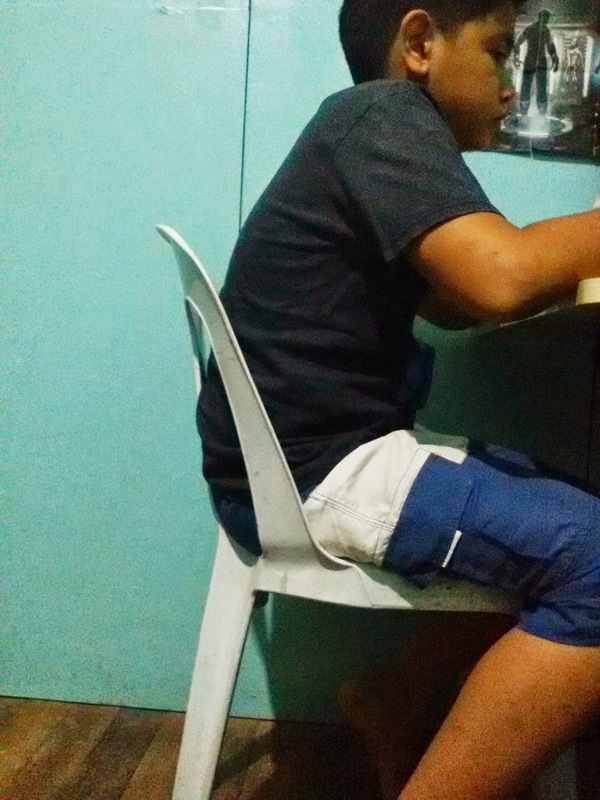 The chair was giving him a hard time to concentrate on what he's doing because he had to mind the discomfort and body aches his chair brought. 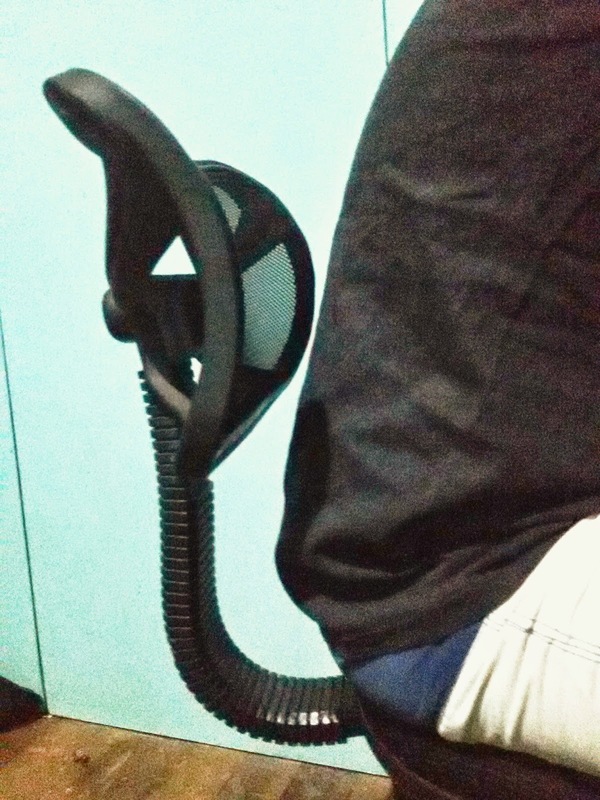 So that computer chair didn't work, we gave him a Monobloc chair. Unfortunately, it didn't help him straight up either. 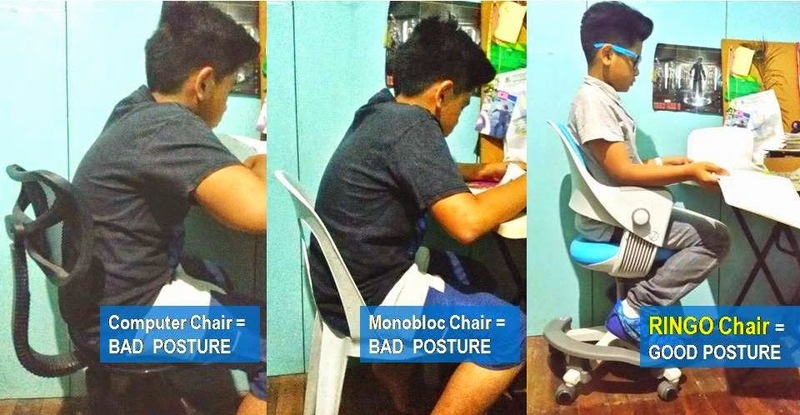 Although his lower back could rest better compared to the computer chair, his upper back still leans and arches forward, still a candidate for a poor posture. 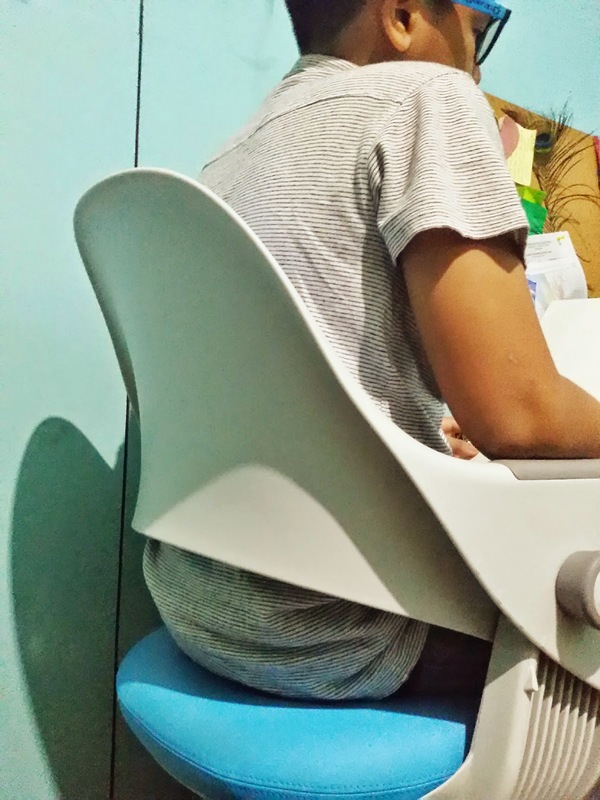 When we received the RINGO Chair, my schoolboy tried it and he couldn't be any happier with this! His full back was well-rested. His posture if you'd notice is correctly straight. His feet touches, if not the floor, a detachable foot rest to support his body and leg weight. For someone who is practical, I don't wish to buy expensive study chairs that I need to change ever so often to fit my two growing children. 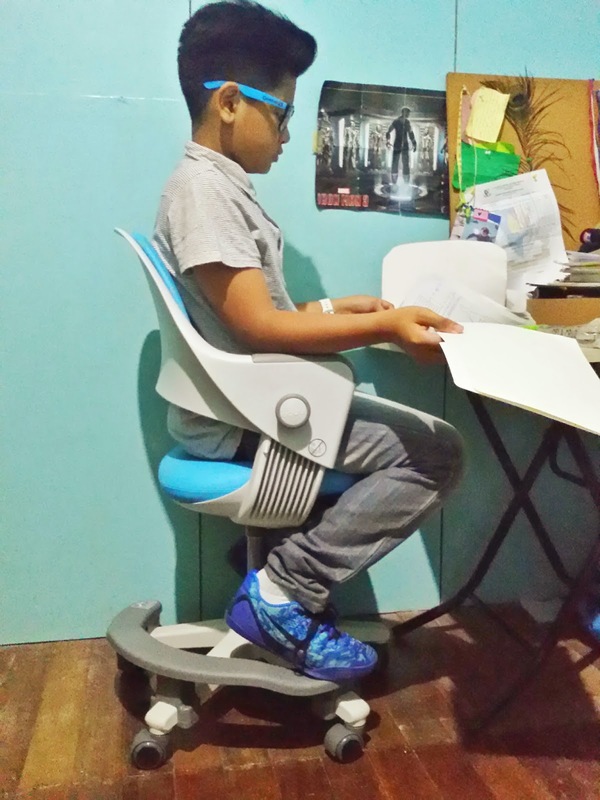 My search for a perfect and posture-correcting chair that is a child's partner in concentrated studying had been answered by RINGO CHAIR. The chair really grows with the child. Meaning the chair can fit children from 3.2 ft to 5.4 ft! So since I'm only 5.2ft tall, the I can fit in the chair too! What's more, there's a knob at the side of the chair for the back rest, which could be adjusted to four different levels (Level 1 for kids aged 5-7/Level 2 for kids aged 8-10, Level 3 for kids aged 11-12/Level 4 for kids aged 13+) to fit the child sitting on it. Fits small and big children like my seven-year apart boys! Admit it, our children loves to make chairs turn and ride it like a car, but it could sometimes distract them from studying or concentrating on their other school tasks. 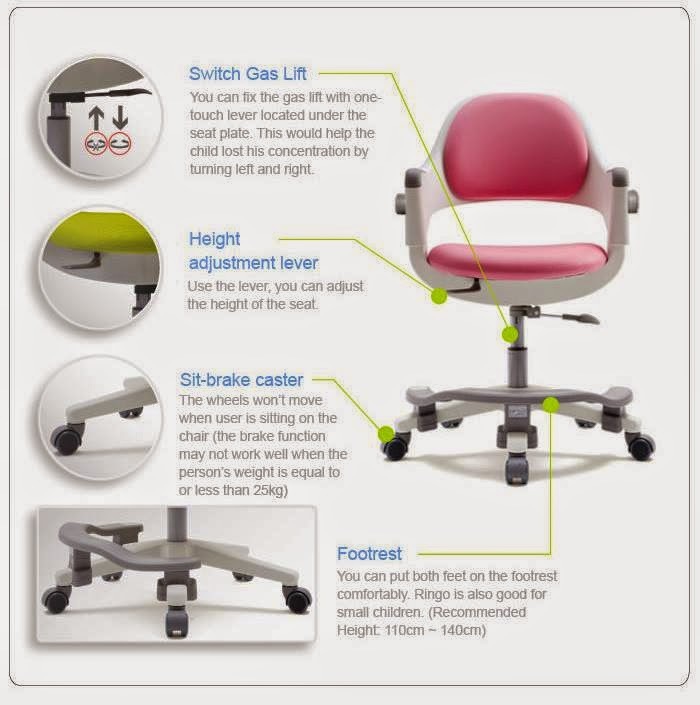 The RINGO Chair has a lever at the bottom which could stop the rotation of the chair and breaks on its wheels to keep the chair from moving. When my tween is big enough to use this chair, my little boy could still use this and they will grow together. Just a few adjustments on the height and depth of the backrest and the little one could perfectly fit on it too! Cleaning and making it look like brand new is also not a problem because the cushion for backrest and seat is detachable and washable. It comes in fabric or artificial leather in three colors: Blue, Pink and Green. Will it last for years? YES I really think so because it's made of durable materials, had passed international quality standards and is also recognized by international-award-giving bodies in world famous design awards for its clever ergonomic design and excellence (Red Dot Design Award, Pin Up Award, International Forum Design Award, Designpreis Deutschland Award). Here's a video which will surely awaken your interest in this growing RINGO chair. 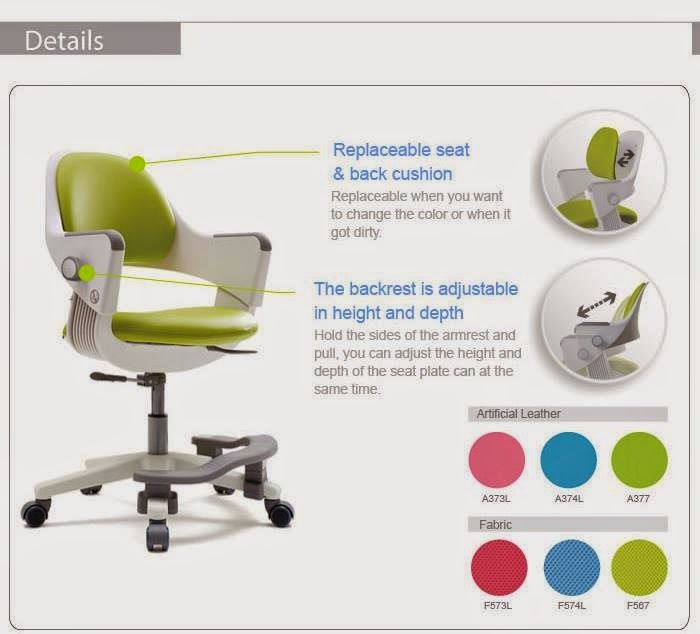 It will explain further the features and why it's important to have an ergonomic chair for our children. Fursys Philippines is the exclusive distributor of the RINGO Chair. They had been joining Baby and Family Expos and school fairs to let parents, children and even school administrators experience their chairs first-hand. In a recent fair they participated in Brent International School, the parents and administrators were very impressed with the chair and saw how it could really help in health and mental well-being of their children. Brent International School is now inquiring and for their own school's use. 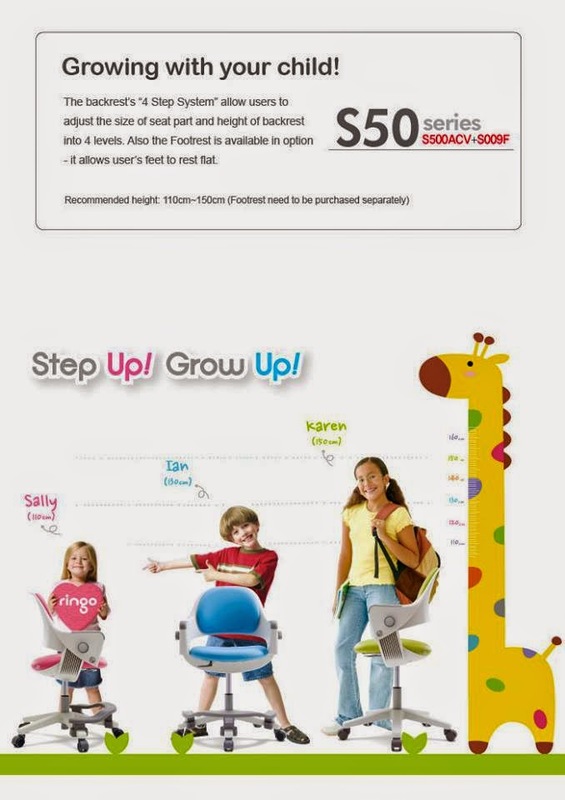 I am like any parent, skeptic at first, but believe me, when you see this chair and what it could do for your children, and when your children experience the chair themselves and how it could actually adjust to fit kids of any age (from 5 to 13+), you'd want it right away for home use for your children. RINGO Chair is Mommy-Approved! I highly recommend RINGO Chair to any parent who has their children's physical and mental health as one of their top their priorities. 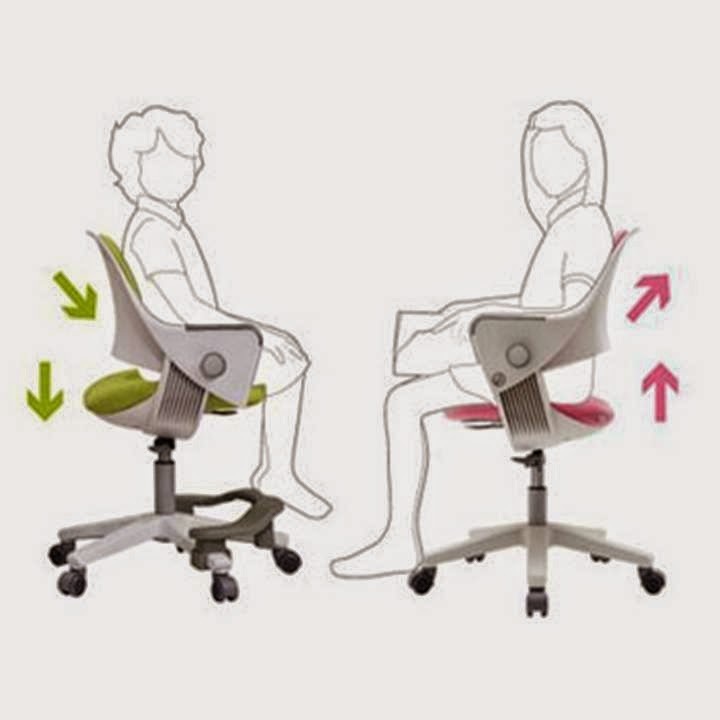 If you want to get a RINGO Chair, you may contact me in the comment section below so I could give you my referral. You may also check their WEBSITE for more information as well as like them on FACEBOOK for updates. Thank you Fursys Philippines for letting my children experience the RINGO Chair, it will definitely grow together with my boys, more especially the little one who's starting school this year. Disclosure: We received the RINGO Chair for review purposes. All opinions written above are mine and never influenced by Fursys Philippines.